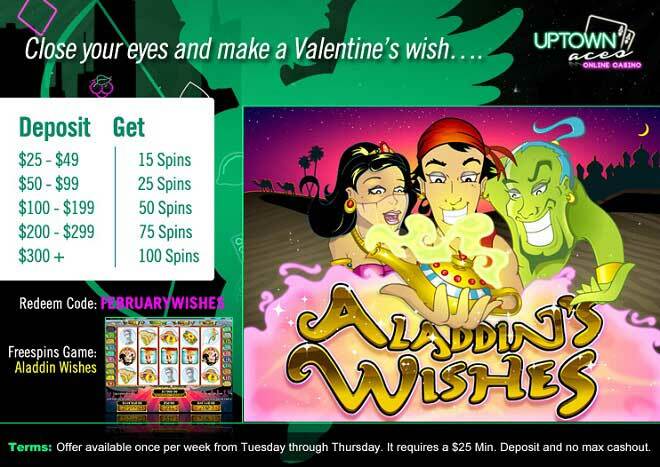 Your Winning Valentine Wishes Come True Uptown With 100 Daily Free Spins! How will you be celebrating the month of love Uptown? How about making your winning wishes come true the moment you deposit as little as $25? February is here to spellbind you with tons of loving feelings and winning opportunities. Spin the reels of our popular Aladdin Wishes slot and you’ll be transported to a magical world of wins! Love and affection aren’t the only feelings you’ll be experiencing this February – you’ll also be making your Valentine winning wishes come true twice per day throughout the month! Spins winnings hold 10x playthrough and no max cashout. Redeem 2x per day throughout the month!